Why would I need self storage in Solana Beach, CA? There are a variety of reasons why you might need self-storage in Solana Beach, CA. How much is a storage unit in Solana Beach, CA? The cheapest storage unit in Solana Beach, CA is $48.00 per month. What size storage units do you have available in Solana Beach, CA? In Solana Beach, CA we have sizes that range from 4'x4' to 10'x30' to suit your storage needs. How much is it for a 4'x4' storage unit in Solana Beach, CA? The cheapest 4'x4' storage unit in Solana Beach, CA is $48.00 per month. Located just 20 miles north of San Diego, Solana Beach is the quintessential Southern California beach town. Though the area grew rapidly through 1960, it wasn't incorporated as a city until 1986. Today, Solana Beach is a small and vibrant city set against the backdrop of the scenic Pacific Ocean. With a variety of beaches and parks, gorgeous homes, a colorful artists' district, and easy access to the rest of Southern California, Solana Beach is a relaxed yet well-connected community. Solana Beach's first residents, known as San Dieguitos, lived in the area as early as 11,000 years ago. In the late 18th century, Spanish explorers moved into the area, and along with the rest of California, Solana Beach became part of the United States in 1850. The Solana Beach area grew slowly until the early 20th century, when the construction of Lake Hodges Dam contributed to sudden growth throughout the area. In the 1920s, Colonel Ed Fletcher bought 140 acres to develop into the Solana Beach community. Fletcher hired one man and provided him with a high-pressure fire hose, giving him the massive task of eroding the coastline to create Fletcher Cove beach and entry point. After three months of work, the beach was completed, and Fletcher hosted a celebratory grand opening that drew people from all over the area. 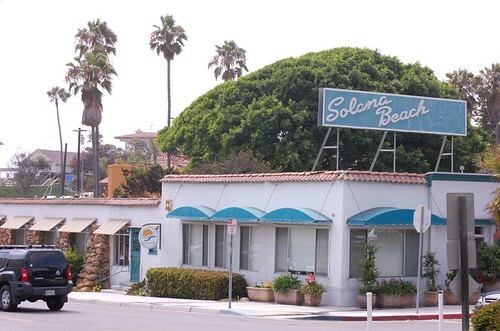 Solana Beach grew at a steady rate throughout the 20th century, experiencing a few population booms after World War II and in the 1980s and 1990s. Solana Beach and the surrounding San Diego County are home to many businesses in the health care, government and military sectors. Naval Amphibious Base Coronado, the Marine Corps Recruit Depot and TSC are the area's largest military employers, while Kaiser Permanente, Kaiser Foundation Hospitals, Sharp Memorial Hospital and Naval Medical Center San Diego provide thousands of jobs in the health care field. In Solana Beach and the Greater San Diego metro area, the largest industries include government, professional and business services, trade and transportation, and education and health services. These industries are also growing quickly and can be a great place to start if you're planning to look for a job in the area. The Solana Beach School District and the San Dieguito Union High School District serve the public schools of Solana Beach. There are a number of private schools in the city as well. Though there are no major colleges or universities in Solana Beach, you'll find plenty of options just a short drive away in the nearby towns of La Jolla and Carlsbad. Utilities: San Diego Gas & Electric is the city's central energy provider. The city manages residential water services. Garbage and Recycling: EDCO provides regular collection of trash and recyclables in Solana Beach. Transportation: The local bus service in Solana Beach is called The Breeze, and it is a popular method for getting around the city and the surrounding communities. If you're looking for the most affordable homes in Solana Beach, you'll typically find them on the southern edge of the city. Solana Beach's priciest homes tend to be on the northern side of the city and near Lomas Santa Fe Country Club. In Solana Beach, the median home value is well into the seven-figure range. This is due largely to the city's coastal location and many beachfront properties. However, there are a variety of more affordable options as well, including apartments and homes farther from the beach. Our lowest priced units in Solana Beach, CA average $48.00 per month. 43 people have reserved units in Solana Beach, CA in the past 30 days. There is 1 location within Solana Beach, CA's city limits.